Most new or established beekeepers buy honey bees in packages. Package bees are reliable sources from year to year and are in great demand. Orders for package bees should be placed very early in the year. The question is: Where can you find someone selling a package of bees. Answer is: Subscribe to Bee Culture Magazine or The American Bee Journal to find reliable package sellers. If you buy from the internet there is no way to tell you if the person listing bees for sale is someone reliable or not. Neither of the above beekeeping magazines will sell ad space to someone with a history of bad relations with customers. And there are some selling package bees that should not be trusted to help you if you have a problem. Beekeeping basics: Keeping honey bees is a fascinating and profitable pastime that can be enjoyed in several ways. You may want to keep bees for the honey they produce, or you may want to keep them for their services as pollinators, or just because you would like the fun of learning about one of nature's most interesting insects. You can keep honey bees almost anywhere in the United States. We would like to alert you to the fact that keeping bees is not for everyone. If you have had an allergic reaction to a stinging insect such as wasp or bee, you should use extreme care. A single honey bee sting can bring on serious reactions to some people -- even causing death. Normal reactions include: pain, and swelling at the sting site. The good news is that one can wear protective equipment designed to avoid bee stings. The Females of the hive: The queen and worker bees are produced by fertile eggs laid by the queen. It is important when beginning a new hive of bees to have a queen laying fertilized eggs. The bees produced from the fertile eggs will become worker bees and if you look closely -- this queen is laying an egg in each worker cell built by the worker bees. She will lay a thousand eggs or more each day depending on the number of worker bees in the hive to keep the brood area warm and food enough to feed all the young larva. 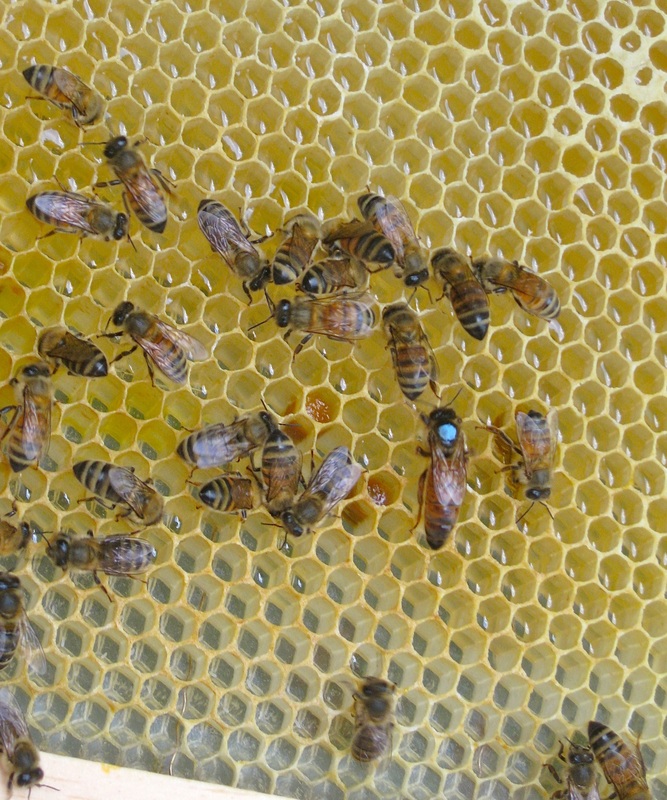 As a new beekeeper, one of the most important skills to develop is the ability to see eggs. The egg is small and hard to see in new comb. It also helps as a new beekeeper to have your queen marked. A small dot of paint is placed on the thorax of the queen bee. The different colors used generally indicate the year the queen was born. The dot not only aids the beekeeper in finding the queen but it can provide information such as how old she is and if the bees replace her for some reason, the new queen will have no mark. Why eggs are so important! The success and growth of a new hive of bees will depend on the queen's ability to lay eggs producing worker bees. Worker bees do all the work. A queen is usually surrounded by worker bees. The queen is an egg laying machine. The worker bees feed and care for the brood (eggs hatch and become larva which must be fed and capped over when they get ready to pupate). For a hive to succeed, the queen must lay enough eggs to replace all the bees that die (worker bees live about 40 days during the working season) and add to the foraging population to store enough honey stores for winter. Thus, if you get a package of bees to start a new hive and the queen is poorly mated or may not be mated at all, the hive will most likely fail within six weeks because not enough eggs are being produced to replace all the worker bees that came with the package -- they most likely will all die within 40 days after you get them. The first step in bee management is to determine the likely success of the newly started package and the queen that came with it. Worker bees gather pollen and nectar to sustain the bees in the hive. Any animal needs food to survive. The beekeeper can aid the bees by providing sugar syrup as a supplemental food source or buy one of the products "patties" that contain pollen and sugar. Any food given to bees should be available during a cold spell especially in northern climate condition. The most serious problem is the queen is not accepted by the bees in the package. The second most serious problem is the bees may die of starvation and third on the list is the queen is poorly mated. It is the responsibility of the beekeeper to know what is happening in the hive during these few critical days because if weeks go by before a problem is discovered, it will be too late to do much about it. Remember the worker bees are necessary to the hive's success and if they all die in 40 days the hive will be lost unless new bees replace them and add to the bee population. I have seen it all and some new beekeepers are upset because the bees in their view should be able to survive on their own -- like wild rabbits, pheasants, deer, or any other wild creature you can name. I am of the opinion that people who feel this way should not become beekeepers. I will mention the male bee later but at this point in a new hive's life, drones (the name for male honey bees) are not needed. And if you get a lot of males in any package of bees you purchase, realize that all they will do is consume valuable food supplies that could be better used to produce worker bees. Later you will develop the ability to determine if you are getting good packages of bees (few drones and most of the bees in the package worker bees). A few dead bees will be found in almost any package of bees but I am talking about a layer of dead bees on the bottom of the package. Dead bees in the bottom of a package are not acceptable -- they are sleeping permanently and paying for dead bees is just dumb. I may be getting the "cart before the horse" by talking about bees before putting your bees into the hive but you need to understand the honey bee before you go out to buy the equipment to put them into. Some people are making a lot of money taking advantage of new beekeepers who lack knowing what is a good deal and what is not. I am "old time" and do not take kindly to individuals selling package bees short of weight or people selling nucleus hives that are nothing more than started package bees and getting premium prices for them. This is a close up of a package of honey bees. Most bees are inside the cage but a few can be seen outside -- these are called hitchhikers. Do not be alarmed -- they generally want to be with the bees inside the cage but got left out during the shaking process. The bees in the package got there by being taken from a hive of bees, dumped down a funnel into the package -- a can of sugar syrup and a queen in a cage was given to them for the trip to your new hive. This package of bees has a few dead bees in the bottom of the cage. Not a problem and most likely what you will see when you receive your package of bees. The can and the queen cage will not be visible because they are covered with bees. It may be very intimidating for a new beekeeper faced with the job of installing these bees into a hive. You must have all hive equipment on hand at the time the package of bees arrive. Bees can not survive long in a package especially in hot weather. If they can not be installed the same day they are received a person can keep them in a dark and cool area. In hot weather a fan blowing air thru and around the cage is helpful. You know they are too hot when you do not see them clustered as shown here. Some water sprayed on the wire screen will help as well -- I am talking a mist of water -- not a full drenching with the water hose. One secret of those who handle package bees is spray sugar water onto bees to help conserve the sugar syrup in the can -- A small garden sprayer filled with sugar water helps. I have a two gallon sprayer set aside just for this purpose. Do not use any sprayer that has been used to spray pesticides. Usually three parts water to one part sugar is used in the spray mix. If the sugar is not well dissolved, it will plug the spray nozzle. There are many ways to put a package of bees into a hive. The first steps are all much the same. Check the package of bees when you pick it up or when it arrives by mail. Yes, package bees are sent in the mail! Compare what you see with the picture above. If there is a layer of dead bees on the bottom of the cage, ask for your money back. If the bees die after you pick them up it is generally assumed the bees died because of the way you handled them. So before you transfer the bees into your vehicle let the shipper know if anything is wrong. After you drive home it is too late. Once home treat the package of bees like you are bringing home a new baby -- Tender Loving Care! See instructions above. Make sure all equipment is set up and ready to receive the bees. That means the foundation needs to be fastened into the frames and the boxes nailed together. Bees don't seem to mind if the hive is not painted. Bees in the package are going to die everyday. Every day you delay in putting the bees into a hive reduces your chance for success. If the bees have not been handled properly they will be making a lot of noise and eagerly seeking a way out of the cage. Cool them down and spray or use a paint brush to put sugar water on the wire screen of the cage. To avoid a sudden rush of bees out of the cage be sure they are calmed down or you will regret opening the cage. No worry -- bees still can not get out because the syrup can in the cage blocks their way out. The real trick is getting the can out of the cage/box so the queen in a cage can be removed. 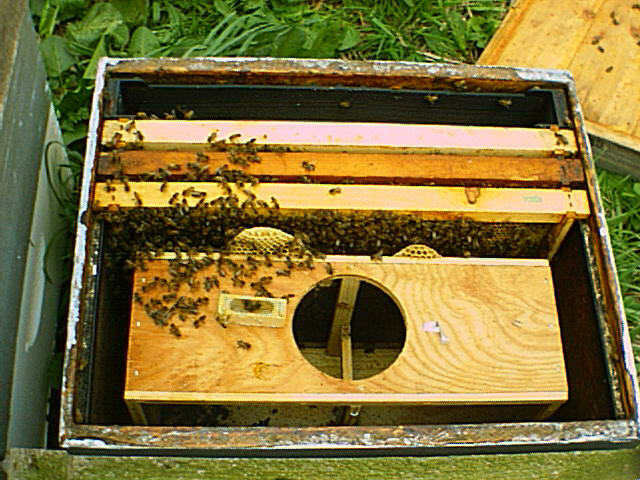 The queen cage is usually fastened to a wire or tab that holds the queen near the top of the package and the syrup can. Queen cages are made of plastic or wood. The three hole Benton cage shown here is still popular with package bees shipped out of the south. Is the queen alive? The queen in the cage shown here is dead. A live queen should be lively and moving about inside the cage. Read down to see how to remove the queen cage from the package. If the queen is dead Contact the person you bought the package from immediately and they should replace the dead queen. This is a good reason to install the bees into a hive as quickly as possible after you pick up the package. The bees without a queen will not make a hive for you! It may take several days to get a replacement. If you bought two packages, you can take the bees with the dead queen and place them together with the good package. Later when your replacement queen arrives, you can move the hive you started and set the new hive for the new replacement queen in its place. Why do it this way? The bees fly from a hive and fix its location into memory. When they return from the field on foraging trips they return to the place from which they flew. So field bees will return to populate the hive with the replacement queen. If you by chance set up the new hive in a location away from the original hive location and move frames of bees into the new hive location with the new replacement queen to populate the hive what will happen? Many of the moved bees will return to the old hive site -- that was their home location and the new replacement queen will be abandoned by the bees transferred on the frames -- a few may stay but be prepare to be disappointed. The young bees moved with a queen laying eggs and not get flying to forage will generally stay with the moved queen hive. Be sure to feed both hives well. If the queen is alive There are various ways to introduce queens to a package of bees. Queen cages are referred to as introduction cages as well. There is a good reason to allow the bees to release a queen. They do so by eating out the candy blocking the queen's exit from the cage. The queen is a stranger to these package bees. She is not their mother and has a strange smell the bees are not accustomed to. Often if released too soon, the bees will kill the new queen. If the queen is alive when you open the package that is good. The package producer and seller has completed their obligation to you. They will not replace a queen not accepted by the bees because that is considered out of their control. If the queen later turns out to not lay eggs, most reliable package producers will replace the queen but not the package bees. Again another reason to check your hive early so problems can be spotted. So it is reasonable to ask "How often should I check my hive?" Ask any two beekeepers and you will most likely get a different answer from both but I would recommend you check your queen cage to make sure the queen has been released in three days. If she is still in the cage after three days take a nail and push a hole thru the candy that remains to make it easier for the bees to release her -- generally required with the type of cage shown above. Any cage with a plastic tube holding the candy does not need a nail to increase release time. Some beekeepers will tell you it is okay to just release the queen after two or three days and I can not argue with that but I like a little insurance by waiting for an extra day or two. After the queen is out of the cage you are not out of the woods! The question then becomes "did the bees accept her?" Do you see where the queen cage was located? If not look to the top center of this frame where there is no comb -- just below the light on my shirt where the frame touches my stomach. And what else does this frame tell us? The beekeeper did not bother to check for more than a week or more because there is brood capped over already in the new comb built on this frame. 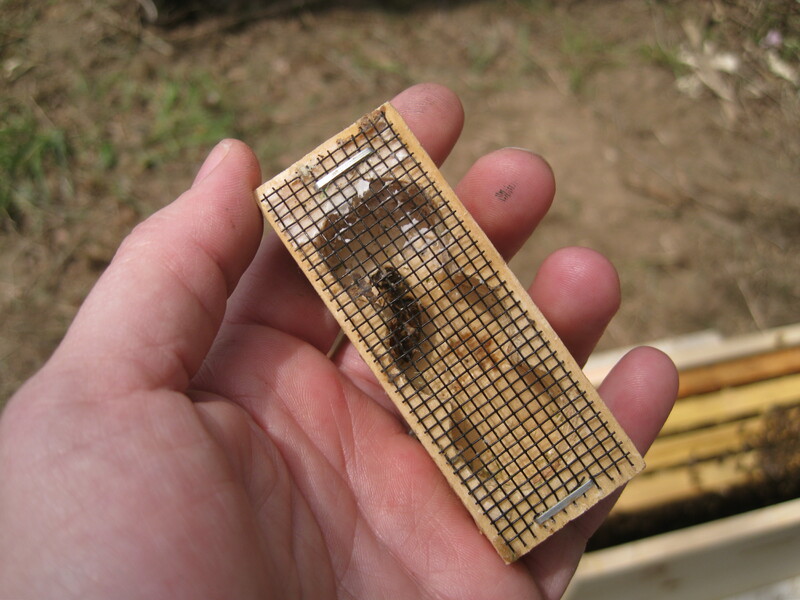 Queens begin laying eggs just as soon as the bees can build out the cells on new foundation. 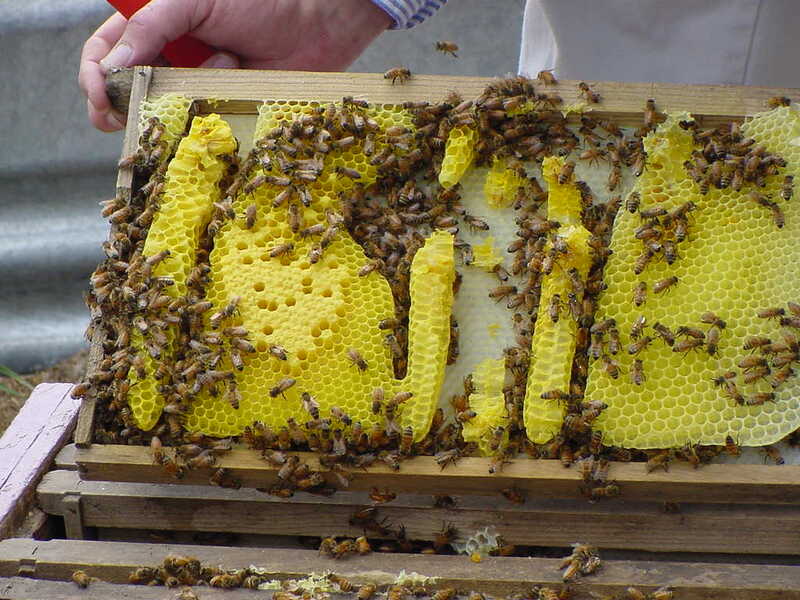 Another issue with this frame is the beekeeper is using white plastic brood comb. It could also be black or green but the fact is, a beekeeper using plastic foundation in a hive must use all 8 or 10 frames in a hive body. There can be no extra space between the frames and new beekeepers are often frustrated with getting bees to draw out comb on plastic foundation because they buy a hive body with 9 frames rather than 10 frames -- bee supplier makes a little more by not supplying that 10th frame and the new beekeeper thinks they got a complete super of frames. After all foundations is drawn out, one can use 9 frames in a 10 frame bee hive body. Maybe one reason some beekeepers will tell you not to buy plastic. I rather like black plastic foundation and to me it has several advantages over beeswax wired frames. "Putting the queen cage into the hive and getting the bees out of the package"
Remember to place the queen cage near the food supply given to the bees from the package. Often beekeepers will place the syrup can over the inner cover hole as supplemental food for the bees and place an empty super to protect the syrup can with the top cover placed over it. Queen failure seems to increase if the queen is located away from the place the bees will cluster. I have seen queen cages put on the bottom board of the hive. This may work in warm weather but not cold. I consider the board man feeder useless in cold weather conditions for feeding a new hive of bees. It is a feeder placed into the entrance of a hive with a glass quart jar of sugar syrup serving as the food. In cold weather it is better to use a feeder that fits over the bees or is inside the beehive where the bees can get to it. Bee need supplemental feed during cold weather especially if in a newly started hive. Remember there are many ways this is done. Here I am working with a new beekeeper getting ready to install her packages into her new hives with the assistance of her husband. She is painting sugar syrup on to the wire of the bee package. I recommend that a package of bees should be fed sugar syrup 10 to 15 minutes before the work begins to remove the syrup can to get the queen cage out of the package. 2) The bees are a bit sticky and clean each other off. They are less likely to fly. The next step is to remove the syrup can -- grasp the wire to the queen cage -- remove the queen cage and replace the syrup can back into the top hole of the bee package. Thus, bees are still confined to the package. The syrup can is easy to remove if the package is laid on its side. The hive tool is handy to get the can started out of the hole and once started it should come out easy. But easy does it! Work slow and deliberate. Note the tab is showing beside the syrup can. This is a 3/4 inch metal tab stapled to the queen cage. Do not let it slip back into the cage when the syrup can is removed. When the can is just about ready to remove, take one hand and hold the tab. As soon as the can is removed the tab is pulled out with the queen cage attached to it. Quickly reinsert the syrup can. A few bees will come out of the package on the queen cage. This is nothing to worry about. Now that the queen cage is out of the package, you can relax a bit. The job is to place this cage with the candy plug removed so the bees can release the queen in due time in the new hive..
And a quick check shows the queen is alive and looks very active. And very gently place the queen cage between two frames with the screen side down or facing so bees can have contact with the queen inside. If the wire or metal tab is still attached to the queen cage, it can be tacked in place with a thumb tack. The candy end of the cage is for the most put in the up position so any bees that die in the queen cage will fall down from the candy hole and not plug it up so the queen can get out. Sometimes a frame must be removed to fit the queen cage between top bars in a hive. Just make sure you come back in several days to see if the queen has been released. If she is no longer in the queen cage -- remove it and slide the frames close together so no gap between frames exist. If you removed a frame to get the queen cage into the hive, replace it now! This is not the same hive but this is what will happen in only a few days. And if you don't remove the cage and cut out the new comb, you will be dealing with a big mess a bit later on when you try to remove this frame from the hive. Once the queen is in place you can add pollen patties if you choose. Notice that the queen cage in the picture is placed squeezed between frames rather than being hung from a tab. Now is the time for the bees A number of ways are used to get the bees from the package into the hive. Some place the entire package in the hive body. It is easy to do. Remove five frames and set the package with the top hole facing up on the bottom board. Pry the can from the hole. In this example the beekeeper placed the queen cage on the package. I prefer to place it next to or between frames. This hive has a division board feeder. Other methods include top feeders like shown above ready to be put on the hive with the pollen patties. This is a good method to feed. But again there are other methods used to feed the hive. If you set the package down in the hive -- by all means get the package out as soon as the bees move out of it. If they refuse to move out of it, you will need to shake them out. Usually doing this later results in some very angry bees. And in this picture of the package inside the hive, note that the bees have already started building comb between the package and the frame beside it. Installing bees by shaking them directly onto the top of the frames of a hive. It may seem a bit messy and a lot of bees might be flying about but it is quick and easy. I would not recommend this if the bees have not been well fed prior to the shaking out of the package. After you install a package or two -- this is no big deal as long as the bees are fed prior to shaking them onto the top bars. Can you see the boardman feeder jar placed in this hive to feed them? The bees quickly move down with a little smoke encouragement. You can place the inner cover or top feeder on the hive after the bees move down on the frames. What could go wrong? Well a number of things! Don't install your package of bees into a hive and then take a two week vacation to Alaska. Don't take on more than you can handle! Installing one package takes time. Two take more time. 1) At least three days after the package is installed in the hive check to see that the queen is released. If not, you have something to manage. 2) In five day following the installation, Check for eggs -- if you see them it indicates the queen is somewhere in the hive. There will be time to see her on another visit. 1) Eggs are hard to see but it will not be difficult to see the bees working at cell building. You should see evidence that the bees are building comb. The bee population should still be close to what it was when you installed the bees into the hive. The next lesson will cover things (management techniques you will use to help the hive survive). 3) In ten days you should see comb being drawn on three to five frames and the cells should be filled with nectar across the top near the top bar and the rest should be full of eggs and young larva. I am assuming you are feeding the hive on a regular basis. 4) In fifteen days you should see capped brood and it would be a good time to check on the queen if you have not seen her up to this point. Many new beekeepers have trouble finding queens and it can be challenging sometimes for experienced beekeepers as well. But the trick is to find eggs on a frame and look for her where brood is being raised. Do not smoke the hive with a lot of smoke. Use just enough to cause the bees to retreat just a little. If you use a lot of smoke you may cause the queen and bees to start running about the hive -- forget locating her if this happens. It is my believe that every new beekeeper should start with a package of bees so they gain the experience to watch a hive of bees develop. A new beekeeper will also have time to learn as the bees build up -- it is a gradual process -- not as fast as a nucleus hive. In beekeeping you can start with a "baby" (a package of bees) or a "teenager" (a nucleus hive).